Every summer, I get a “hankering” for tomatoes with fresh basil. The paring works so naturally together– it’s fresh and subtly sweet and wonderfully herby. The flavor takes me back to my grandpa’s garden, where as a child I used to help him harvest tomatoes fresh from the vine. Sweet, freshly picked vine-ripened tomatoes… now that’s a taste you never forget. I can almost smell it now, those happy growing plants and the freshly turned earth. 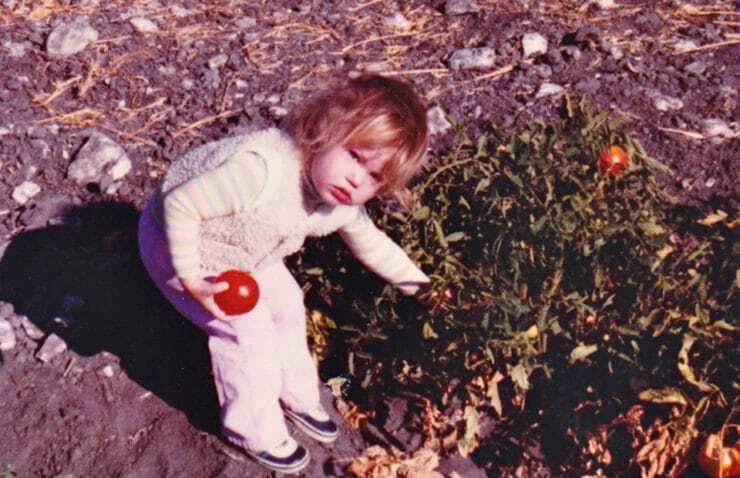 Little me tending my grandpa’s garden. Like most Americans, I grew up eating red tomatoes (roma tomatoes, beefsteak tomatoes, cherry tomatoes, etc.). It wasn’t till college that I discovered heirloom tomatoes. I was quickly enchanted by the colors and flavors of the various heirloom varieties. Only recently have I discovered why heirlooms taste so amazing… and of course, I found the answer in food history. Heirloom vegetables are plant varieties from original seeds that are over 100 years old. For an heirloom vegetable to be considered a true heirloom, the plant must have been introduced prior to 1951, when plant breeders began to hybridize inbred plant lines. The plant must also be open pollinated in a natural way– by insects, birds, wind or weather. Popular heirloom vegetables include squash, beets, beans, corn, lettuce– and, of course, tomatoes. Experimenting with and cultivating heirlooms has been a popular passtime for centuries. Even Thomas Jefferson was a fan. Today, heirlooms are prized not only for their interesting colors and shapes, but for their natural genetic variation. In the past century, genetically modified seeds have been developed for commercial farms. Today, most vegetables are grown in large single-species crops from genetically modified seeds. Vegetable species are genetically altered to create specific traits– drought and frost resistance, tolerance of pesticides, and the ability to withstand long shipping periods. Flavor is often sacrificed in favor of other genetically desirable traits. You’ve probably experienced this yourself, if you’ve tasted a tomato from the grocery store that appeared ripe, and found it bland and not at all sweet. The more these genetically modified vegetables are cultivated, the less biodiversity there is, and the more we become dependent on large corporations (who own the patents to the genetically modified seeds) for our food. This means that heirloom vegetables don’t just taste better– they’re better for the environment and biodiversity. Heirloom enthusiasts cultivate these varieties in hopes of preserving the species for future generations. 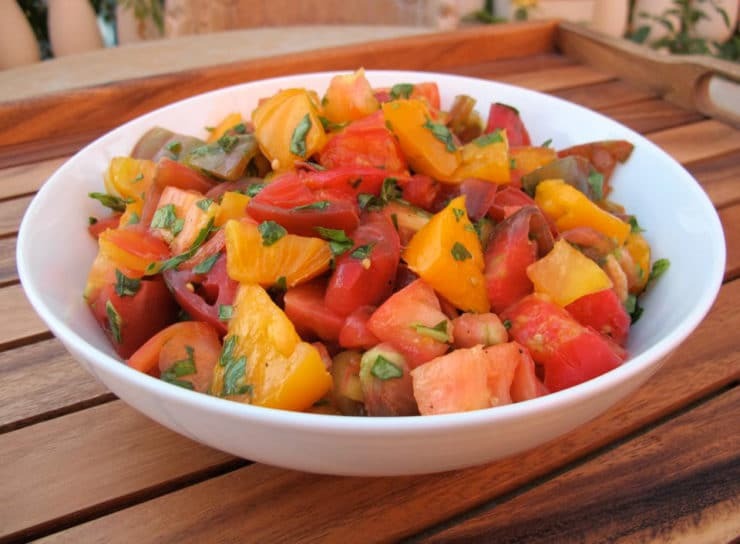 This is all my round-about way of telling you why I use heirloom tomatoes in this salad! Heirloom tomatoes are super flavorful, and this salad celebrates their natural goodness– you don’t need to add much in the way of dressing, just enough to make the flavors pop. There are all kinds of ways to dress the salad up. You can add some sliced sweet onion to it for crunch and spice, or some minced fresh garlic if you like. A little fresh mozzarella or crumbled sheep’s milk feta cheese wouldn’t hurt, either. *Note: The online gluten free forums I read said that Tabasco pepper sauce is gluten free, but you may wish to contact the company directly to confirm this, since I have not. Or you can just leave it out and sub a dash of cayenne pepper. 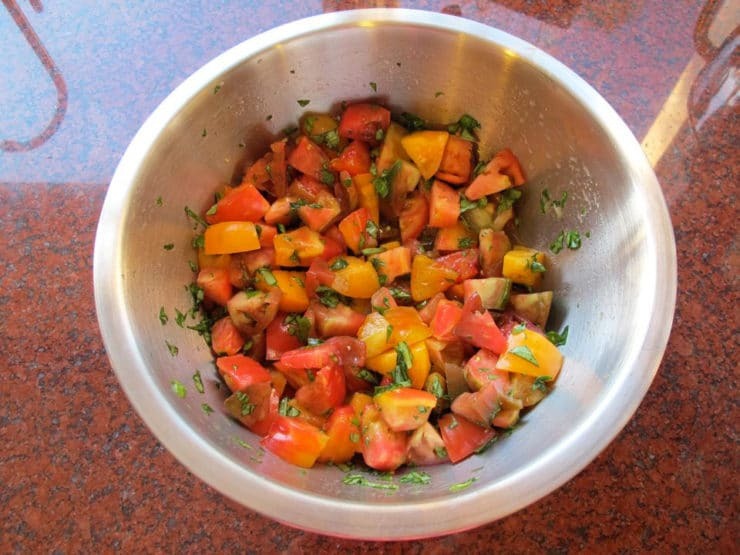 A simple heirloom tomato salad dressed with fresh basil, olive oil, lemon juice, salt, sugar and tabasco. Kosher, Pareve, Vegan, Gluten Free. 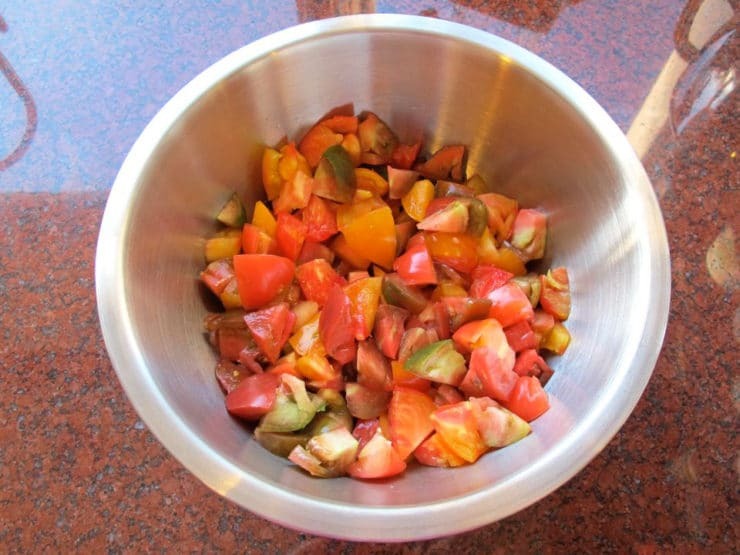 Slice the heirloom tomatoes into 1 inch chunks and place them in a large mixing bowl. 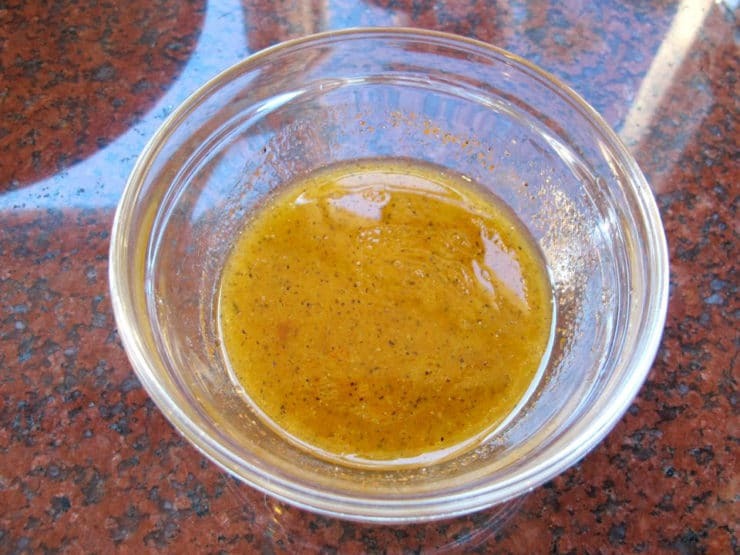 In a small bowl, whisk together lemon juice, olive oil, sugar, salt, black pepper and tabasco sauce (optional). Pour dressing over the salad and toss to coat all ingredients evenly. Cover salad with plastic wrap and let the tomatoes macerate for 30 minutes. Serve salad at room temperature with a slotted spoon. 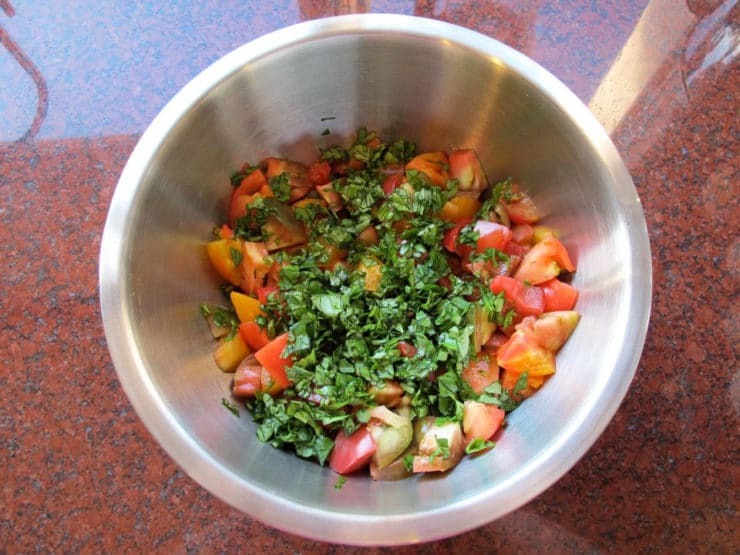 Liquid from the tomatoes will collect in the bottom of the bowl, and the slotted spoon will allow you to serve the salad without making a wet mess of your plate. You may also wish to drain off some of the excess liquid from the salad bowl prior to serving. Take the leftover juice and put a shot of Vodka in it and sip it while your getting the other food together….Is amazing! I tell my 4 year old son its “”Tigers Blood”—Cracks him up. Love this salad. Delicious, easy to make and it looks beautiful. Made it with Moskvich, Cosmonaut Volkov and Cherokee Purple heirloom tomatoes from the garden. Mmmmmm. My grandmother made a similar tomato salad. Just chunks of tomatoes from her garden with homemade tarragon vinegar and olive oil and some chopped onion. We dipped homemade bread into the juices that collected at the bottom of the bowl. A perfect lunch! Reading this also took me back to my childhood, so thank you. I think it needs parsley! Everything needs parsley! I love it, great website, I am hooked! Shiska! So cute! After a late lunch for Father’s Day, we weren’t very hungry this evening so I decided this was the perfect meal – it was and both my husband and I really enjoyed it immensely. It will be a regular in our home for the rest of the tomato season. Thanks, Tori. We have our seeds from Danube Delta (it’s heaven on earth, really – a very diverse eco-system close to fertile land where people cherish their gardens as urban kids cherish their laptops and iphones :). I have several varieties of heirloom tomatoes planted and can hardly wait until they start producing. This recipe will be perfect for them. Thank you! We don’t get heirloom tomatoes here, I’m so jealous of their pretty colours and superior flavour. They just look so gorgeous on a plate too. Love the simple treatment, tomatoes and basil is the essence of summer, delicious! I had no idea what heirlooms really were – just figured it was some new fancy variety. Turns out it’s not so new. LOL. This looks fabulous! Don’t throw the delicious juice that remains out… dip some good bread in it! this looks delicious..I am making it for a birthday BBQ I am having in honor of my friend, they will love it. Yum! And I love your history lesson on heirloom tomatoes! I just wrote a post about tomatoes today on my blog — we are so on the same page! 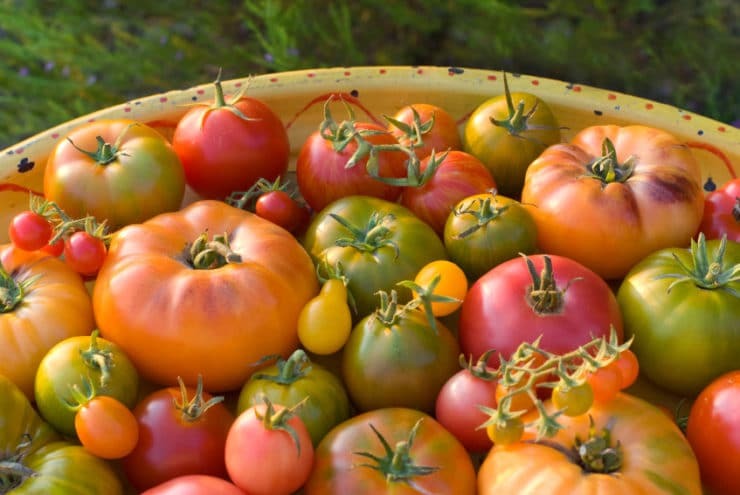 Have you heard of the new book Tomatoland by Barry Estabrook? I haven’t read it yet, but it sounds like a very enlightening (and depressing) look at the sad state of the modern mass-produced tomato. Again, love the blog! Hey Rachel! I have heard about Tomatoland, sounds like a fascinating read. It’s on my Amazon wish list, hoping to get a copy soon! What a colorful dish! I definitely have to make this one. Thanks for sharing this one. great salad! one of my favorites! thanks for the info on heirlooms! I have a giant hankering for tomatoes right now! They should be showing up around here any day now and I’ll be keeping this lovely recipe on hand for when they do. Look at all those colors! They look fantastic! This is a salad that I would definitely eat every single day…yum! 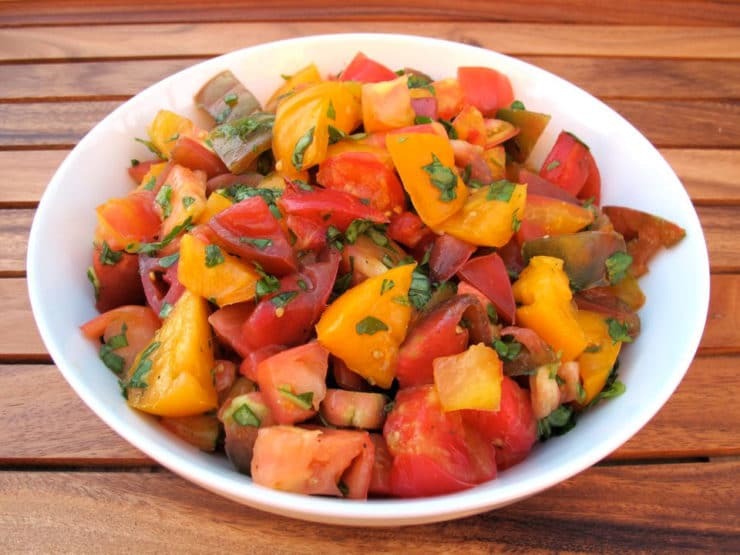 Fresh summer tomatoes really are the best, this salad looks wonderful! Oh, this is the epitome of summer! Gorgeous salad! Tori, what a beautiful post. Those heirloom tomatoes are breathtaking – so much variety and colour before we started tampering – and your dressing sounds so good, I can almost taste it from here… the tabasco sauce is a great touch! Loved looking at all the photos – so nice to see that you grew up with nature in grandpa’s garden; lucky you. Cold dishes like this are great for the summer and this one with tomatoes is an unusual but delicious find. Glad you posted this-Yum! What a bowl of summer right there, Tori! I know what you mean about tomatoes grown at home in the backyard. I actually smell the tomatoes when I go to the store. It seems like some smaller stores buy straight from a local grower who’s not doing something funky but simply growing a darn tomato the right way. I love it when it has that slight pungent aroma to it when you take a whiff 🙂 I’m a nerd, I know, lol. Bio sci major that I was, I totally appreciated the historical and biological aspect of this post! I’m totally digging on the sauce for this salad! And yes, a mild white cheese would totally rock out in this! Oh isn’t that gorgeous! Heirloom tomatoes are no doubt the tastiest tomatoes, and I bet this salad is just deeeeeelicious! Thanks so much for your kind comment on my blog! I’m glad you found me and, in turn, I found you. I’m looking forward to seeing more lovely recipes such as this one. Heirloom tomatoes are such a treat in the summer! Absolutely perfect! 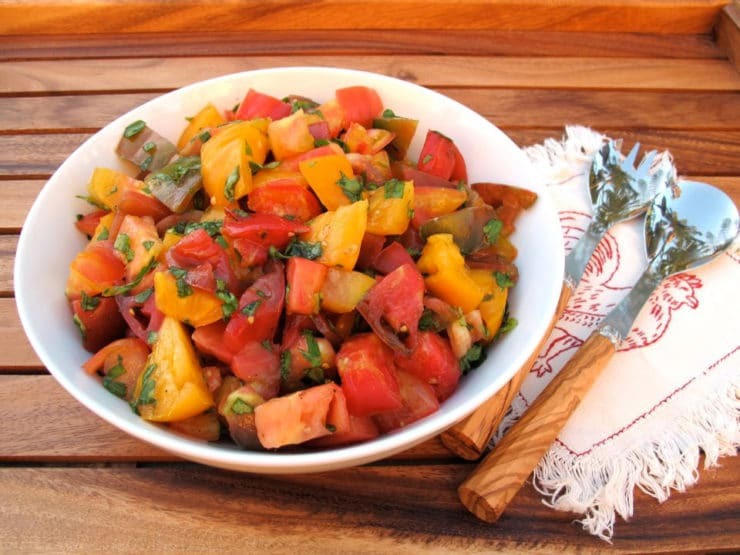 I love heirloom tomatoes and any tomato salad! One of my favorite hot weather dishes! Very nice Tori. It’s so beautiful. My hubs would like this. I am not a tomato fan. Which is odd since we live 20 minutes from the heinz tomato plant. Lol! This area supplies all those great tomato products like ketchup, which I love. But tomatoes as a whole, not so much. This makes me wish I did though. I always love the look of them in recipes. The heirlooms are very popular here. I have a friend who has a natural habitat yard. It is fun to visit. What a lovely salad. It made me want to lick my computer screen. Thanks for sharing.